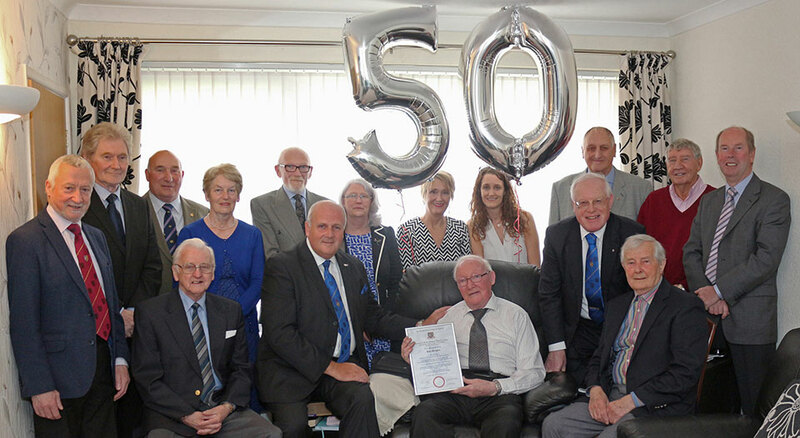 John Gregson, an honorary member of Preston Guild Lodge No 4408, having celebrated his 90th birthday, has achieved 50 years in the Craft. Unfortunately, his health was such that he felt unable to attend the lodge for a celebration meeting. As a result, arrangements were made for a visit to John’s home to honour the occasion and present him with his celebration certificate. David (left) congratulates John on his achievement. Members of the lodge, including John’s brother David, headed by Assistant Provincial Grand Master David Winder and accompanied by the Preston Group Vice Chairman Geoff Saul, duly arrived on the appointed day to be welcomed by John’s family and friends. In attendance was Richard Graham the current master of Waverly Lodge No 4723, accompanied by his wife Jenny, who had made the journey from Surrey to take part in John’s celebration. 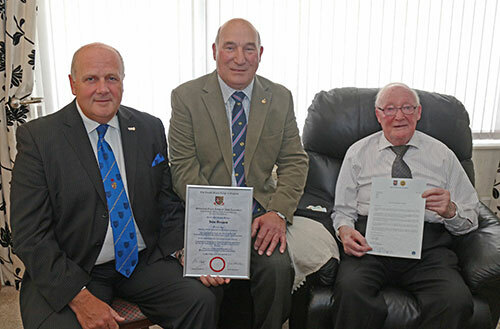 David Winder began the celebration by presenting John with a certificate signed by the Provincial Grand Master Tony Harrison and the Provincial Grand Secretary Peter Taylor recording John’s 50 years as a member of the Craft. The certificate included the appreciation of the Provincial Grand Master for John’s devoted service to the Order and extended his fraternal greetings on this auspicious occasion. 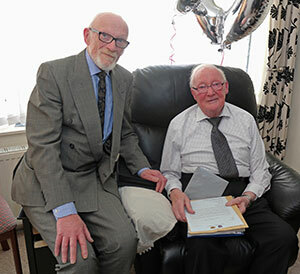 David added his own contribution to the occasion by presenting John with a booklet he had prepared giving a history of John’s life both in and out of Freemasonry and concluded with his own congratulations. The booklet recounted John’s national service in the Royal Navy and, at the age of 22, him being appointed a travelling salesman for G W Collins, a grocery wholesaler. This led to him joining the Commercial Travellers Association and ultimately becoming chairman of the Preston Branch. It was at this time that John was initiated into Commercial Travellers Lodge No 3493 on the 4 May 1968. His time as an amateur wrestler, taking part in several contests and exhibitions was mentioned, as was him teaching his wife Joan, several holds to help with his practice. His marriage to Joan in 1953 was blessed with three daughters, Carmel, Helen and Angela. Unfortunately, Joan has gone into care with John, assisted by his daughters making daily visits to be with her. Returning to his working employment, the booklet refers to John’s change of career that involved a move to Surrey as a warehouse distribution manager for catering wholesalers, Bookers. The company had numerous contracts with many large companies and establishments in the London area. John’s contribution to the business resulted in him being promoted to Area Distribution Director and presenting various papers at the senior management national conferences. Richard passes the PrGM’s letter to John. Now based in Surrey, continuing his Masonic career, John joined Waverly Lodge in December 1976. He went on to serve as master of the lodge in 1983, receiving Provincial honours in 1991 with the rank of PPrAGSuptWks. During his year in office, along with other masters and their ladies in the Province, he received an invitation from the Provincial Grand Master of Surrey, Rt Hon The Earl of Shannon to attend a cocktail party at the House of Lords. It was an event that John and Joan were pleased to accept. Still retaining his membership of Commercial Travellers Lodge, John regularly travelled back to Preston to attend most lodge meetings. Unfortunately, in 1988, a change of managing director and the resultant management reshuffle saw John being made redundant at the age of 60. Continuing with working life, the next section of the booklet, saw him return to Preston for a complete career change as the owner of a chip shop, based in Ingol. Having reached the age of 64, John decided to retire and sold the business. His return to Preston in 1988 saw him installed as master of Commercial Travellers Lodge. His brother, David, was initiated in March 1989 with John performing all three degrees. Going on to serve the lodge as secretary and director of ceremonies, John received Provincial honours with the rank of PPrSGD. in 1997 and was promoted to the rank of PPrGSuptWks in 2008. He was exalted into Preston Guild Chapter No 4408 in 1989, achieving the position of first principal in 1998. He went on to serve the chapter as Scribe Ezra from 1993 to 1997 and again from 1999 to 2003. In 2006 he was appointed in Provincial Grand Chapter with the rank of PPrDGSwdB. Returning to the present occasion, on behalf of the members of Preston Guild Lodge and, after consulting with John’s daughters and his brother David, the immediate past master Malcolm Berry, presented him with an envelope. The envelope contained a celebratory card and a supply of vouchers for John to purchase items to supplement his hobby of painting in oils. As a teenager, John had been a keen artist, but as life intervened it became a hobby that was put to one side. However, it did become a hobby that John returned to at the age of 87. In preparing for the occasion and knowing that John had been a member of Waverley Lodge in the Masonic Province of Surrey for many years, the secretary of Preston Guild Lodge, John Baron, contacted the Surrey lodge informing them of John’s impending 50th celebrations and seeking information relating to John’s time with them. The lodge responded by not only providing the required information but also sent their current master, Richard Graham, hot foot to Lancashire with a letter of congratulations from the Provincial Grand Master of Surrey Ian Chandler. Richard read out the letter, for all to hear, before adding his own good wishes and congratulations. This was followed with a round of applause from all present. Being an emotional person, John’s response was a choked: “Thank you,” a response that was all that was necessary, and warranted a second round of applause. The day closed with John being congratulated by his brother, David. Surrounded by his family and friends, John receives his certificate from David Winder.